It’s the first week of July and having grown up in the great state of Michigan it’s also the time of year most of the automotive industry gets a two-week furlough for changes to the assembly lines. Of course, I don’t work in the automotive industry so I’m at work and writing this post on my lunch break (explains the occasional mustard stain on my keyboard) instead. But considering I’m posting this on July 2, that means those of you in the Great White North have just celebrated “Canada Day” yesterday and my fellow citizens of the USA will be celebrating our Independence Day on July 4 in just a couple of days. What does this have to do with summertime woodworking? Not much, unless you’re like many of the folks I know who are taking time off right now to enjoy the warm weather and the fun and activities of the holidays. In that case, you’re probably carving out some time in the woodshop or maybe trying to figure out what to do in there if starting a project just isn’t something on the list at the moment. Without giving away all the details of Steve’s great advice, he shares suggestions about tackling tool maintenance, cleaning out the shop, stocking up on materials and more. He has some great ideas for getting in the woodshop and getting stuff done without having to miss out on all the fun the warm days of Summer has to offer. 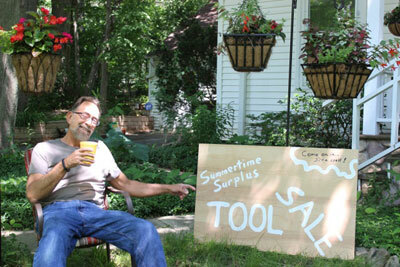 Visit Steve’s article “4 Ideas for Summertime Woodworking” at the Highland Woodworking Blog by clicking here.